In addition to the 17 Planning Excellence Awards presented this year, 12 Achievement Award recipients were selected by the awards jury as examples of strong planning work. The Achievement recipients were recognized collectively at the Awards Luncheon held during APA's National Planning Conference. Philadelphia's University City District (UCD) created The Porch at 30th Street Station, a new public space located directly at Amtrak's doorstep. Applying its signature place-based, data-driven, "iterative placemaking" approach, UCD was able to capitalize upon a stretch of newly created sidewalk by PennDOT after removing 33 parking spaces. The Porch offers pedestrians a dedicated area to sit, stroll, socialize or enjoy the views of the Schuylkill River and Center City skyline. 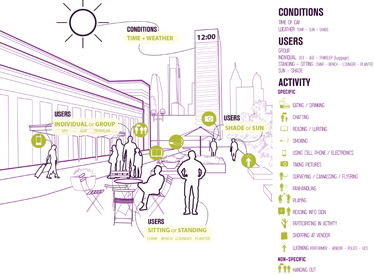 Interface Studio analyzed the data to create a case-study of best practices in data-driven placemaking. In 2001, Maryland became the first state to implement a state-level Art & Entertainment (A&E) Districts program to encourage economic development and community revitalization in underutilized areas. The purpose of the A&E program is to develop, promote, and support diverse artistic and cultural centers in communities that preserve a sense of place, provide unique local experience, and spur economic revitalization while adhering to smart growth principles. 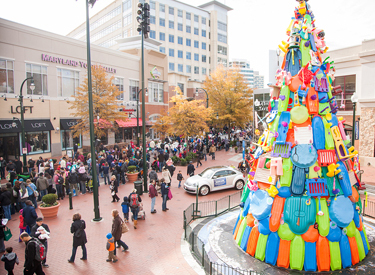 Under the direction of the Maryland State Arts Council, the A&E Districts Program has become a model for states across the country interested in using metrics to demonstrate the economic impact of a thriving art and cultural scene in a community. The Lake Tahoe Sustainability Action Plan is a key part of the restorative process to rebalance the region's environment, economy, and community quality, while confronting climate change. Different from typical climate change action plans, this plan is regional — it covers two states, five counties, and one incorporated city. It provides a toolkit that local agencies can use to develop actions under a consistent regional Sustainability Framework. The plan also evaluates vulnerability based on climate change research in the Lake Tahoe Basin and makes recommendations to help make the region more resilient. 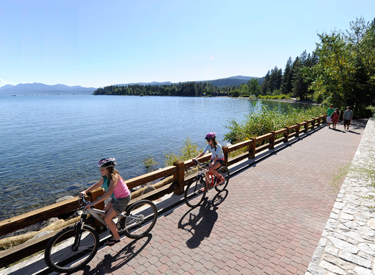 The Lake Tahoe Sustainability Action Plan is the first of its kind for California and Nevada given the complex regulatory framework in the region. Situated at the mouth of the New York Bight, Staten Island is vulnerable to intense wave action and erosion. 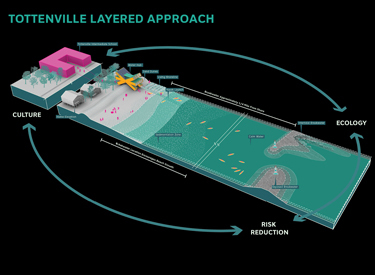 By combining a coastal resilience structure and habitat enhancement techniques with community engagement, Living Breakwaters advocates for a layered approach to risk reduction that extends offshore to inland, and avoids creating a wall between people and water. The Living Breakwaters design reduces risk, revives ecologies, and connects educators to the shoreline, inspiring a new generation of harbor stewards and a more resilient region over time. 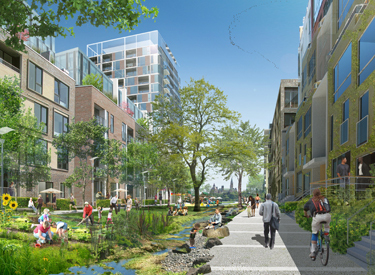 The conceptual design, developed by the SCAPE/Landscape Architecture team for the U.S. Department of Housing and Urban Development's Rebuild by Design Initiative, was one of six winning proposals in the global competition. The proposal was awarded to New York State and will be implemented by the Governor's Office of Storm Recovery with $60 million of CDBG-DR funding allocated specifically for this project. Lower-income neighborhoods of the City of Opa-locka, Florida, located in Miami-Dade County, were lacking open space for families to come together to play and enjoy their city. 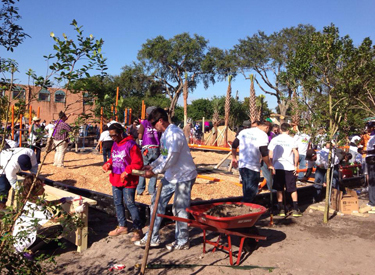 In an effort to create safe, public spaces and encourage physical activity outsides, the Gold Coast Section of the APA Florida Chapter and the Opa-locka Community Development Corporation worked in concert to implement the Pop-Up Park Initiative, ultimately resulting in the development of a permanent park with support from KABOOM and other partners. The initiative brought immediate short-term results in the form of sweeping community support and engagement and long-term results in the form of better planning with an emphasis on community health. 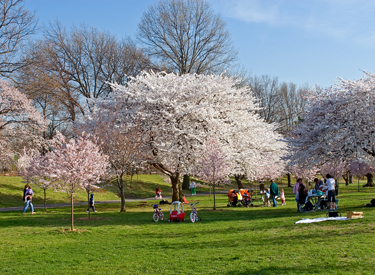 Branch Brook Park is the jewel of the Essex County park system. The City of Newark, New Jersey's Olmsted-designed park has served citizens for 116 years, but was in need of revitalization. The Branch Brook Park Alliance, through a public-private partnership with Essex County, conducted an in-depth analysis of the treasured space and the Olmsted firm's original design intent, resulting in a seven-volume Cultural Landscape Report. The report outlined a comprehensive plan for the preservation, restoration, and revitalization of the park, including new infrastructure enhancements and inventory of its waterways, trees, and other vegetation. Since 2003, Essex County and the Brand Brook Park Alliance with Rhodeside & Harwell have completed 18 restoration projects with an investment of more than $30 million, restoring Branch Brook Park's beauty. The public's access to Ottawa, Ontario's riverfront has been restricted for decades because of contaminated lands and blighted buildings along the river's edge. The Domtar Lands Redevelopment Plan proposes to transform the abandoned space in the Chaudière area into a vibrant, world-class sustainable community where the public will be able to live, play, and work alongside a vibrant waterfront. 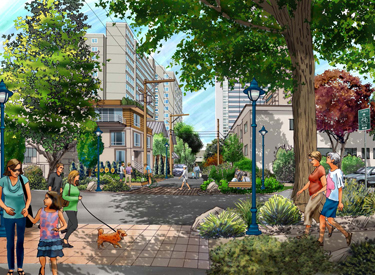 The incorporation of green infrastructure, urban food production, and preservation of historic buildings are the cornerstones of the master plan. The plan envisions a thriving, diverse local economy that supports fair employment, inclusive communities, and international fair trade. To address the challenges facing Vancouver's West End Community — including lack of affordable housing, struggling local businesses, heritage buildings at risk, and aging public facilities — the city's Planning and Development Services Department prepared the West End Community Plan. The plan provides a clear but flexible framework to guide positive change, development, and public benefits in the area over the next 30 years. It includes long-range and shorter-term goals, and provides policy directions in areas such as land use and built form, housing, transportation and public spaces, heritage, arts and culture, local economy, community facilities and amenities, and environmental sustainability. Extensive public and stakeholder engagement was critical in creating a plan that was tailored to meet the evolving needs of the community. 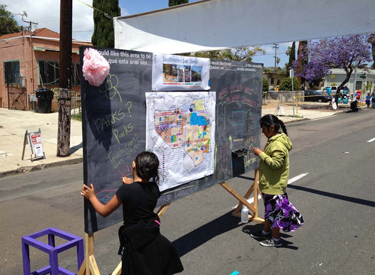 In 2013, the City of San Diego sought to engage underrepresented neighborhoods in the community planning process. Acting as the urban design consultant for the city, M.W. Steele Group used Pop-Up Outreach efforts to engage the community in planning conversations. Through a series of three installations — a chalkboard chat, pop-up feedback trees, and street sign survey boxes — the simple, targeted outreach efforts enabled the city to solicit feedback from historically hard to reach populations and establish a dialogue among community members. Most importantly, the Pop-Up Outreach program reestablished a person-to-person connection between planners and residents in neighborhoods with historically low levels of trust in the local government. 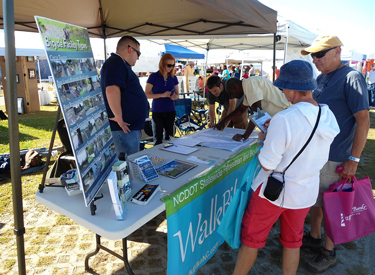 WalkBikeNC is North Carolina's first statewide plan for improving walking and bicycling. Championed by the North Carolina Department of Transportation's Bicycle and Pedestrian Division, the WalkBikeNC comprehensive plan addresses mobility, safety, economics, health, and environmental stewardship. The plan defines the walking and biking needs of residents and conveys the policies, projects, and programs necessary to meet those needs. Developed through a unique collaboration among multiple state agencies and private sector funders, WalkBikeNC also engaged more than 16,000 residents. It has laid the groundwork for new collaborations and partnerships. The Greening Lower Grand Avenue plan created a more sustainable and vibrant Phoenix. The plan was developed by a team led by PLAN*et Communities, and was the result of a partnership between the Grand Avenue Merchants Association (GAMA), the city, and a wide range of civic and private entities. 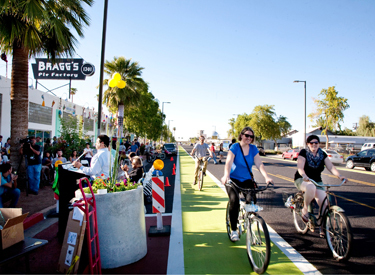 Funded through the EPA Greening America's Capitals program, the plan achieves sustainability goals through innovative design concepts of outdoor community rooms, hubs, links, and gateways, including Arizona's first green bike lanes. The plan has become a model for other Phoenix neighborhoods as well as other Southwest cities. Since the plan's implementation, nine new businesses have opened, membership in the Grand Avenue Merchants Association has increased, and downtown street festivals have grown in popularity. 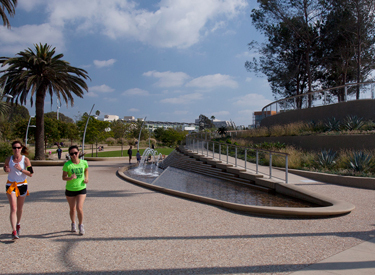 Once a flat parking lot, Tongva Park & Ken Genser Square are a new type of urban landscape that engages visitors and restores the area's ecosystem. Opened in 2013 after nearly 20 years of planning efforts, the parks cover 7.4 acres and offer a lush landscape featuring rolling hills, meadows, and gardens that overlook the Pacific Ocean and the historic Santa Monica Pier. Social spaces are designed for quiet reflection or large community gatherings. The parks also provide physical linkages between the Civic Center and the western edge of the city. The location is just two blocks from the future terminus of a new light rail line connecting Santa Monica to various points within Los Angeles.